Stiebel Eltron tankless water heaters are proof that not all tankless water heaters are created equal! We offer the complete line of Stiebel Eltron electric tankless water heaters for point-of-use, whole house, and commercial applications, including the flagship Tempra and Tempra Plus Series which feature an advanced micro-processor controlled temperature control and flow based power modulation technology. The Stiebel Eltron Tempra and Tempra Plus Series tankless water heaters can fully-compensate for changes in incoming water temperature and flow rate to maintain a precise output temperature. Many competitors advertise that they feature thermostatic controls and power modulation technology, but in reality, they simply don't measure up. Stiebel Eltron's latest generation of tankless water heaters, the Tempra Plus series, feature the industry's only Advanced Flow Control technology. This technology features a sophisticated valve that can automatically adjust the water flow rate when the heater's flow rate sensors detect that the water demand is exceeding the system's capacity. When competitors' systems exceed their flow capacity, the water goes cold - but not with the Tempra Plus! This feature is especially desirable in applications where the electrical service size or other factors do not permit the installation of a more powerful heater model in situations where it may be desirable to handle only occassional high water flow demands. Stiebel Eltron has been manufacturing electric water heaters since 1924. With the only ISO-9001 certified electric tankless water heater manufacturing plant in the world and over 2,200 employees worldwide, Stiebel Eltron's products are based on a history of manufacturing excellence and quality. You can rest assured that no other company in the world sells more electric tankless water heaters than Stiebel Eltron! Conventional water heaters heat water slowly and constantly throughout the day and store the heated water in a large tank so there is hot water available when you need it. Unfortunately, even with the best insulated tanks, much of the energy it uses to heat the water is slowly lost throughout the day. Tankless water heaters, which are also commonly referred to as "instant" or "on demand" water heaters, heat the water only as it is being used. When you turn on a hot water faucet, the heater activates and stays on until the water is turned off. Tankless water heaters not only save energy, but they never run out of hot water. The best tankless water heaters on the market feature sensors and a microprocessor that ensure a precise output water temperature is maintained regardless of changes in water flow rate, pressure, and incoming water temperature. While the original tankless water heaters were primarily used for point-of-use applications only, modern high-output tankless water heaters are suitable for whole house use as well as a wide range of commercial applications. Since tankless water heaters eliminate the standby energy loss from the storage tank, they can cut your water heating costs by up to 50%. Furthermore, they have much longer warranties, take up less space, and, of course, they never run out of hot water! Learn More: The tankless water heater concept and benefits. When a hot water faucet is turned on, a flow sensor in the heater detects that the water is moving and turns on a bank of heating elements or modules. The water passes over the heating modules, usually in series, and exits the heater at the desired temperature. Since tankless water heaters do the entire job of a conventional tank-type water heater in just seconds, they require very high powered heating elements. In more sophisticated units, a collection of sensors and a microprocessor will control the output water temperature to ensure that a precise output temperature is maintain during operation. When the water is turned off, the unit turns off completely and consumes absolutely no power again until a hot water faucet is turned on. While the basic premise is the same, the performance difference between a lower quality unit and the best units on the market is dramatic. Selection of a model appropriate to your application is very important. As noted above, not all tankless water heaters are created equally. Careful selection of both brand and model is important to ensure that the heater will meet the requirements of your application. The most important distinction between models on the market today is if they use power-modulation technology (sometimes referred to as flow modulation) and thermostatic controls. These technologies are necessary to ensure that the output water temperature of the heater remains constant despite changes to the incoming water temperature, pressure, or flow rate. Without this technology, the water temperature can fluctuate significantly especially when a second faucet is turned on when the unit is running, a toilet is flushed causing the pressure to drop, or if you get your water from a well (the water pressure in your expansion tank changes). Without this technology, it can also be impossible to properly regulate temperature to a safe, usable temperature when trying to find a power setting that accommodates both your low flow rate and high flow rate faucets. Unfortunately, many manufacturers advertise that they use this more advanced technology, but in reality, they do not, or if they do, they use a rather crude form of the technology. The good news, is that a small number of units on the market have the necessary flow-based power modulation and thermostatic control technology to maintain a precise output water temperature in all situation. Why should you choose a Stiebel Eltron tankless water heater? First and foremost, the Stiebel Eltron Tempra and DHC-E Series water heaters feature an advanced electronic power-modulating (based on flow rate, pressure, and incoming water temperature) and thermostatic temperature control technology. No matter what the conditions: well water or city water, high flow rates or low flow rates, hard water or soft water, warm climate or cold, you can expect a Stieble Eltron Tempra or DHC-E Series water heater to maintain a precise output water temperature. Better yet, using a simple, convenient digital temperature selector, you can set the temperature at a level that you find most comfortable. Stiebel Eltron tankless water heaters are built to last and feature German engineering and quality components throughout - you won't find a cheap plastic case and plastic heat exchanger in a Stiebel Eltron tankless! All Stiebel Eltron Tempra series tankless heaters include a sturdy aluminum case and copper heating chambers. With their energy savings, longer lifespan, and smaller size, Stiebel Eltron tankless water heaters are an extremely green hot water heater. What else should you know about selecting an on demand water heater? Selecting the right instantaneous water heater for your needs is a function of the technology as discussed above, the maximum flow rate of water you will demand, and your incoming water temperature. Applications which require higher flow rates and/or that are in areas of colder incoming water temperature (northerly regions), will require a more powerful model. Since on demand water heaters have to apply a massive amount of heating power to the water instantly, they have very large heating elements. Correspondingly, they require a larger electrical service than most conventional heaters, so it is important to make sure that your home has sufficient electrical service to supply its needs. The first inclination of many homeowners is to purchase a gas tankless water heater if they have had a conventional gas tank-type water heater in the past, or if they are building a new home, since the common belief is that gas is cheaper. When it comes to tankless water heaters, this is often not true, especially when all the costs are taken into account. Electric tankless water heaters cost only a few dollars per month more than a gas tankless heater to operate based on today's energy prices, they last longer, have better warranties, are more thermal efficient (98%+ vs. 80-85%), take up less space, require less maintenance, and cost dramatically less to buy and install, as compared to a gas tankless water heater. Gas tankless heaters are extremely expensive to install due to the onerous venting, fresh air supply, and gas line requirements, not to mention their higher original product cost. As well, it important to remember that tankless water heaters can last well over 20 years - since natural gas prices are rising at a much higher rate than electricity prices, it is widely expected that a tankless electric heater will actually be cheaper to operate than a comparable gas unit in just a few short years. 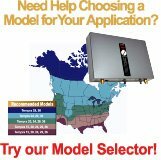 Let us help you evaluate if tankless is right for you or help you select the best model for your application. Learn why a Stiebel Eltron tankless water heater is simply the best technology on the market today! Stiebel Eltron Tempra Series tankless water heaters are independently tested to comply with both US and Canadian safety standards including ANSI/UL499 and CSA-E335-1/3E-94. Stiebel Eltron Tankless Water Heaters are tested and certified by WQA against NSF/ANSI 372 for "lead free" compliance. GET YOUR TANKLESS WATER HEATER TODAY AND JOIN THE TANKLESS WATER HEATER REVOLUTION!! Go Tankless - The Tankless Water Heater Company is a member of the MediaWave group of companies which was founded in 1999 to distribute innovative, technologically advanced products for the home, health, and leisure markets. 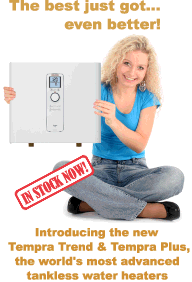 The company is now one of the largest distributors of electric tankless water heaters in the USA and Canada. One of our associated companies was listed as one of the fastest growing companies in the country on PROFIT Magazine's 2007 PROFIT 100 list.